After a talk I gave in Melbourne, Australia, this past June, a friend introduced me to an elderly man who had been in the audience. The man had something he wanted to say. He came close to me and began to speak, from which I recollect only one crucial word: formation. Formation—yes. I could feel my neurons forming new pathways around that bit of Catholic jargon, and suddenly a bunch of puzzling stuff made sense. I was in Australia at the invitation of the Archdiocese of Melbourne, but this event was a thoroughly secular one, on the subject of cooperative enterprise—businesses owned and governed by the people who use them. The gentleman was Race Mathews. And despite his reference to a theological concept, he confessed to being neither a Catholic nor a believer. For most of his career, before retiring to study the prehistory of the modern cooperative tradition, he was a politician in Australia’s Labor Party*. The importance of formation was his latest discovery. Formation is a word Catholics use a lot, in a rather distinct way, rarely pausing to define it. In the life of faith, it is our ongoing conversion to Christianity. It is how we allow prayer, experience and study to mature us. Our formation makes us the kinds of Christians we are, and it comes in many different forms, including quite secular ones. It may be happening when we do not even know it. Mr. Mathews helped me make the simple connection: Business, too, is a kind of formation, for better or worse. Over the years Mr. Mathews has made a series of visits to the Mondragon Corporation, a network of worker co-ops in Spain’s Basque country that currently employs over 70,000 worker-owners. 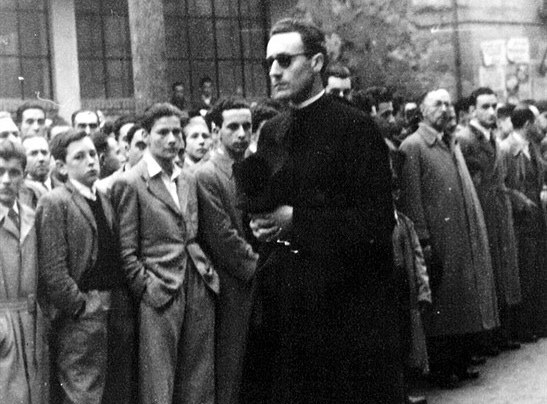 It emerged under the shadow of Franco in the 1950s with the guidance of a local priest, the Rev. José María Arizmendiarrieta, or Arizmendi for short. This is a system of factories, schools, banks, retailers and more, all owned and governed by people who work in them. It is also a beacon of possibility, the world over, that democratic business can work at large scale, though it has yet to be outdone or replicated. Why is it that at Mondragon and elsewhere, Catholics have been so good at creating co-ops? Mr. Mathews’s book Jobs of Our Own traces Father Arizmendi’s precursors from Pope Leo XIII’s 1891 encyclical “Rerum Novarum,” to the ideas of Hilaire Belloc and the Chesterton brothers in England, to the Antigonish movement in Nova Scotia. But only recently, while studying the Catholic Action and Young Christian Workers movements that influenced Father Arizmendi, did Mr. Mathews zero in on the concept of formation. Before Mondragon’s first cooperative factory opened, Father Arizmendi started a school where he and his students developed their plans together over the course of a decade. They let diverse influences form them, religious and otherwise. Following the teachings of Cardinal Joseph Cardijn, the founder of the Young Christian Workers—teachings that also influenced Jorge Bergoglio—they practiced the method of “see, judge, act.” They tested their ideas relentlessly and creatively through practice, and then adjusted the ideas accordingly. Bergoglio, as Pope Francis, once recalled that while a teenager, he heard his father, an accountant, talk about the kind of patient formation that cooperative business requires. “It goes forward slowly,” his father said, “but it is sure.” Francis has recommended co-ops as an antidote to ills ranging from polluting power plants to a technology-obsessed culture. How is your economic life forming you? For many of us, business is a matter of duty and necessity, a thing we do in order to do other things. But it still shapes us. The rules we take for granted at work inculcate habits of mind and heart that surely also guide our reach toward God. I worry for myself about what catechism the economy of competition and accumulation is teaching me. Yet by worrying about questions like this, people of faith have come to believe, and prove, that another way is possible. Correction, Aug. 8: The spelling of Australia's Labor Party has been corrected. Please note that it is the "Labor" Party, not "Labour". Keep the ignorance to a minimum if another country is going to be casually used as reference. Catechesis of the Good Shepherd is a formation method for children, beginning as young as 3 years old. Part of a weekly 2 hour formation includes allowing children time for work. Their work begins simply: time for expressing their response to a scripture or liturgical presentation in art, song, or prayer. But they are offered lessons in practical life where they can learn to care for the environment: polishing miniature brass items found on an altar; watering plants; setting a prayer table for communal celebrations. Work becomes a time for the child to allow the seeds of the kerygma to take root; while the hands are busy, the mind and heart open. As an adult who has joined children in these sessions for 20+ years, I know this to be true for adults as well. Mondragon is a form of free market capitalism. That may surprise many who have read about it. But the organization uses capital to achieve its ends and is based on free association and operates in a free market. That is free market capitalism. If the members of the organization agree to a certain organizing principle and it is freely exercised then it is the epitome of free market capitalism. Mondragon competes in the market place and the prices of its products are determined by competition and is subject to the problems of economic downturns and is not protected by a higher organization from these pressures. By calling it a cooperative, does not make it somehow different from free market capitalism. There have been cooperatives since the world began. It is one form of organization that competes. Thus, Mondragon is still a competitive enterprise and is subject to market pressures. These pressures will affect the types of internal organizations and operations that can be successful. And these business or non profit organization’s internal organization can be quite varied but they must compete in the market place so how they are internally organized will affect their success. If the organizing principles of Mondragon makes it successful, more power to it. Every corporation whether it s a few people or thousands must be organized somehow and there is a large literature on how organization works and how to make them more efficient both for the workers and their output and for the society at large. Mondragon is just one of hundreds of ways to organize. Cooperative are nothing new and are actually the essence of any essential organizations. Nearly every organization is organized on cooperative principles set up by management or shareholders. Employees are expected to cooperate with each other in the organization to achieve a goal. But the organization exists in a competitive environment even if it is organized on a non-competivie cooperative system. The best example of this is a sports team which has several players cooperating with each other in an extremely competitive environment. The question is does the organization of Mondragon allow it to compete in this external environment effectively? The one thing that must be guarded against is not to rig the competitive environment to favor one type of organization over another. As long as Mondragon does not do this, it is a great example of free market capitalism. Free market capitalism is the only moral way to distribute goods. Every other method distorts the distribution in favor of one person or group over another and it is usually the poor who suffer. For an example of how the poor can be affected by technology and how things are produced see the link below. This shows how modern technology affects the way goods are produced and if used wisely will provide cheaper goods so the poor can have a better life because they will have access to these inexpensive goods but at the same time there will be less jobs for people as this technology replaces what used to be done by thousands by a few people and machinery. http://n.pr/1PpH3wR There is no going back from technology like this to small cooperatives which are often inefficient. Better to spend effort on how to make new technological advances pay out for everyone in our society. That is where we should spend our time, not in brining back forms of organization that can not be extended to more than a few. Nothing wrong with these organizations per se, just that they are not the answer and definitely the wrong direction to be headed. Thanks for your response. There are certainly respects in which Mondragon embodies "free market capitalism"; the cooperative thrives by selling its goods in an open market, competing with other firms, and capital is a critical engine for making the cooperative work. But there is a major difference between this kind of organization and the conventional corporations that you refer to as being "cooperative" as well. It's ownership. In Mondragon's case, the owners are the workers—the people who participate in the business in the fullest ways, and so their flourishing is tied intimately with the flourishing of the business. In the case of the conventional corporation, there is generally a significant disconnect between the investor-owners, who seek only financial return, and the workers whose lives depend much more directly on the way in which the business operates. Definitions of capitalism vary. I tend to define capitalism as a system in which the flows of capital are the dominant force in the economy, and it operates largely independently from labor and the state. The vision of a "cooperative commonwealth" (to use a term that was much more common a century ago) is one in which workers and buyers wield capital to meet their needs; the majorty of the people rent capital, rather than a minority of capital-holders renting the majority for the purpose of compounding their wealth. Technology is something that was near and dear to Fr. Arizmendi's heart. He made sure to stress that Mondragon should be well-capitalized and should prioritize technological innovation. The whole system, after all, grew out of a technical college that he founded. A portion of the larger Mondragon system is devoted to serving the R&D needs of the other cooperatives. And given the company's track record as a successful industrial innovator in Europe, Mondragon has proven that cooperative structure and technological innovation are not mutually exclusive, by any means. This article also appeared in print, under the headline "A New Way to Work," in the August 15-22, 2016 issue. Nathan Schneider is the author of Thank You, Anarchy and God in Proof. Website: nathanschneider.info. Twitter: @ntnsndr.